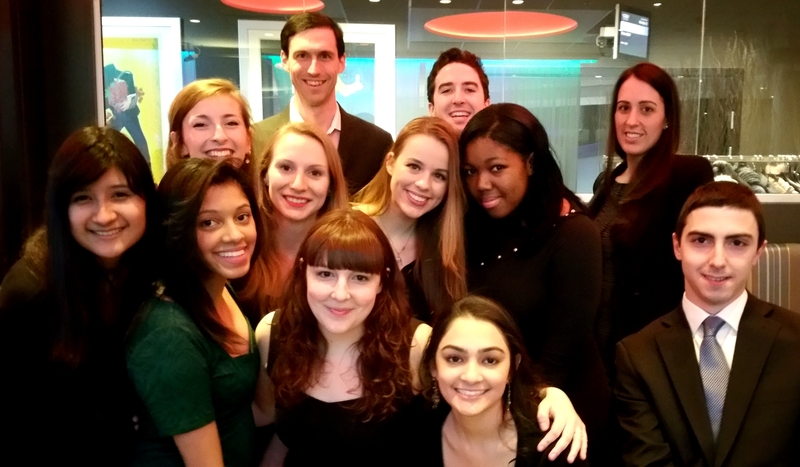 Pace University New York City Model United Nations students attend the diplomatic gala during the 2015 Oslo Model UN conference in Norway. Front row (left to right): Jennifer Diaz 16, Gisselle Rodriguez ’15, Elena Marmo ’15, Priya Sakaria ’17, Vato Gogsadze ’15. Middle row (l to r): Kyla Korvne ’15, Gabriela Johnson ’15, Lindita Capric ’15, Shade Quailey ’15. Back row (l to r): Dr. Matthew Bolton (Model UN advisor), Niall O’Reilly ’16, Kristina Byrne (Pace Study Abroad Office). 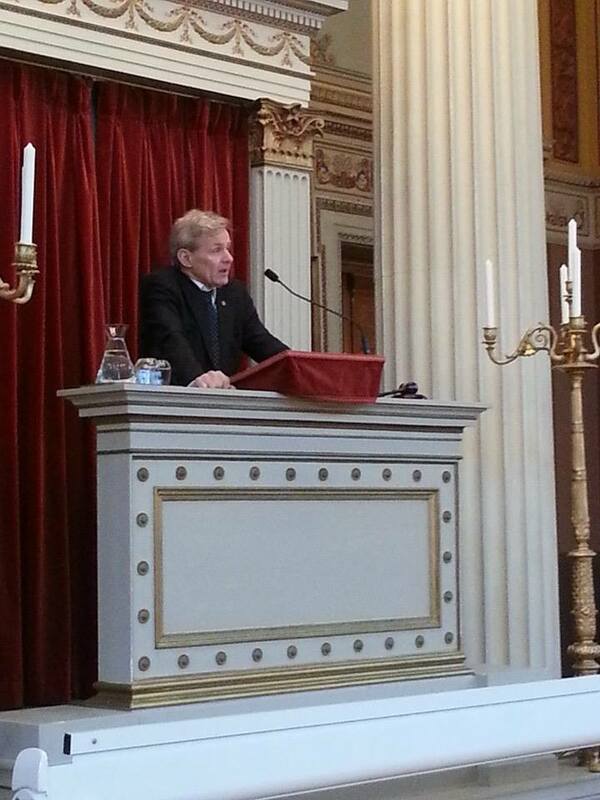 Jan Egeland, former Under Secretary General of the United Nations, addressing the 2015 OsloMUN conference in Norway. “We need people like you to engage with and in the United Nations,” former UN Under-Secretary General Jan Egeland told the conference participants in his Opening Ceremony address. “You are the United Nations – we are all members of member states,” said Egeland, now Secretary General of the Norwegian Refugee Council, urging students to fight for an international system that is more effective at building peace, ending poverty and inequality and halting climate change. Ten Pace students participated in the conference, representing a wide range of countries around the world. They were selected based on their excellence in previous national and international Model UN simulations. In the run-up to OsloMUN, they engaged in intensive research about their country, practiced public speaking and wrote a detailed paper outlining their countries’ position on key policy issues. 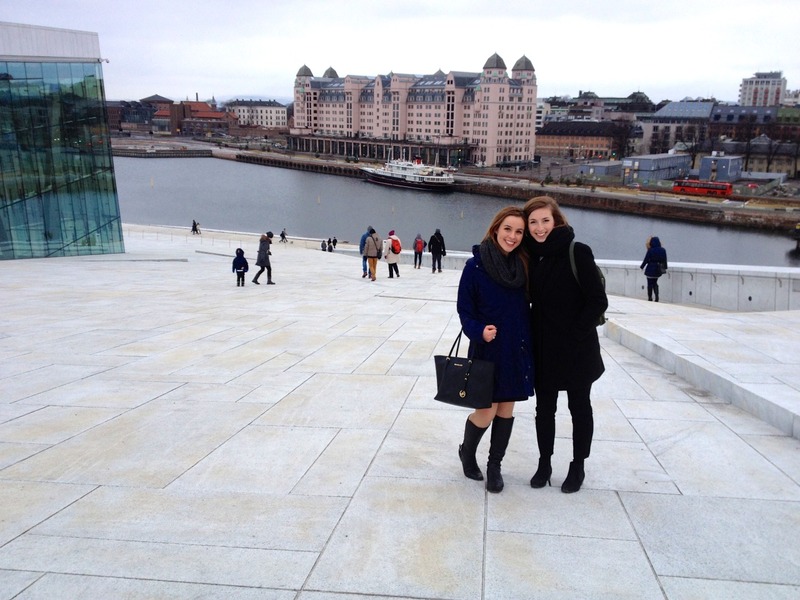 Lindita Capric ’15 and Kyla Korvne ’15 were recognized with awards for their excellent diplomatic skills in the 2015 OsloMUN conference in Norway. “Oslo was an exceptional experience because we got to meet with people from all over Europe and work together to create a common solution to international justice issues in Africa,” said Lindita, who serves as one of four Pace Model UN Head Delegates. They were joined in the African Union simulation by two other Pace students, Gabriela Johnson ‘15 (representing Zimbabwe) and Vato Gogsadze ‘15 (representing Libya – read his blog reflection on the conference, here). “I learned that it is possible for a committee to compromise and collectively write a single resolution, and all it takes is willingness to cooperate,” said Gabriela. “Now I have many new friends in various countries and continents, and I also enjoyed getting closer to the other Pace students on the trip. Another head delegate, Elena Marmo ’15, received an ‘honorable mention’ for her impressive representation of the Russian Federation in a simulation of the UN Security Council’s deliberation on the situation in South Sudan. “Participating in a ‘real-time’ simulation was an interesting lesson in how competing interests can inhibit addressing conflict and ensuring peace – it forced me to reconsider the structure of the UN, particularly the veto power of the Permanent Five members,” said Elena, who is also a member of the Student Peace Alliance at Pace. Also in the Security Council simulation was Gisselle Rodriguez ‘16, who managed with aplomb the difficult task of representing Venezuela’s policy positions that put her at odds with many others in the committee. 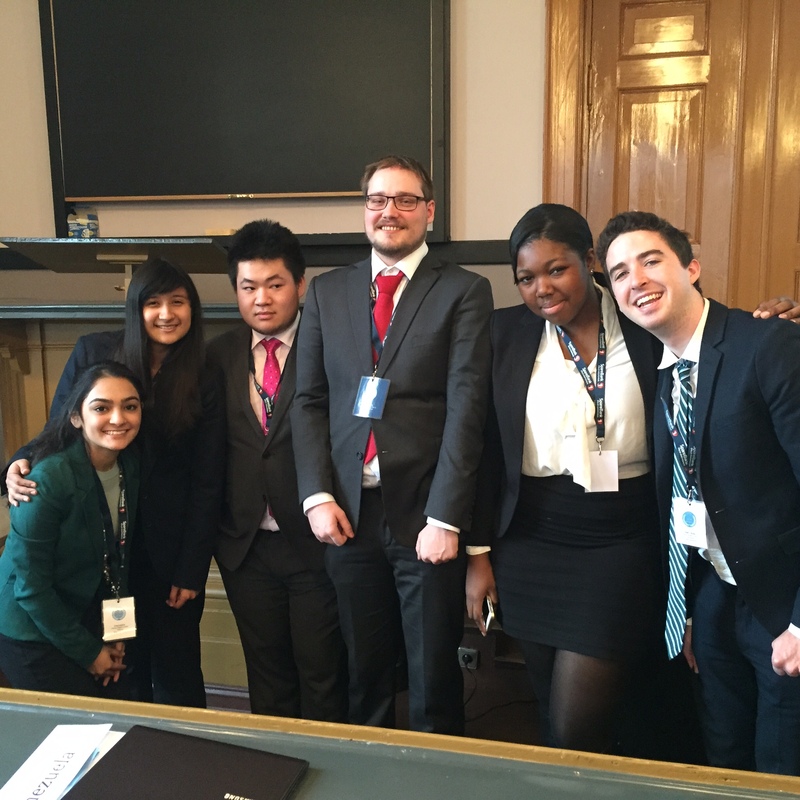 Pace New York City Model UN students (Priya Sakaria ’17 and Jennifer Diaz ’16 on the left and Shade Quailey ’15 and Niall O’Reilly ’16 on the right) who participated in the simulation of the United Nations Human Rights Council at the 2015 OsloMUN conference in Norway, with their committee chairs (in the center). Four Pace students found themselves on opposing sides of discussions on the death penalty in the simulation of the Human Rights Council. Head Delegate Shade Quailey ’15 and Priya Sakaria ’17 (representing Saudi Arabia and Vietnam respectively) were pitted against Jennifer Diaz ‘16 (South Africa) and Niall O’Reilly ‘16 (Germany), as they engaged in debate and procedural maneuvers. Jennifer agreed: “It was difficult for us to come to a consensus on one topic and I can only imagine how many times nation’s agendas clash with one another in the United Nations.” But she found the experience rewarding as it required her to “think and respond to other delegates quickly.” “The trip was a great experience and I am so glad to have had the chance to go,” she said. 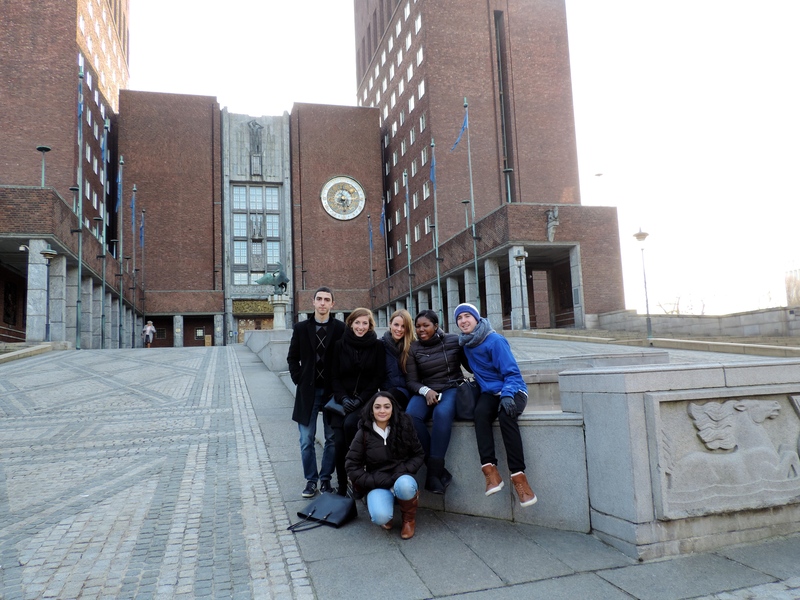 Pace New York City Model UN students visit Oslo City Hall while attending the 2015 OsloMUN conference in Norway. (Back row, left to right: Vato Gogsadze ’15, Kyla Korvne ’15, Lindita Capric ’15, Shade Quailey ’15 and Niall O’Reilly ’16. Front: Priya Sakaria ’17. Located only two express subway stops from the iconic United Nations complex on the East River, Pace University’s New York City Model UN program has more than a 60-year history of excellence in regional, national and international conferences. Model UN at Pace is a class, uniquely integrated into the political science curriculum within the Dyson College of Arts and Sciences and aims to encourage students to develop wisdom, knowledge, skills and community for global vocation and citizenship. This entry was posted in News and tagged African Union, climate change, Dyson College of Arts and Sciences, Human Rights Council, inequality, international Criminal Court, Jan Egeland, Model UN, Model United Nations, Norway, Norwegian Refugee Council, Oslo, OsloMUN, Pace University, peace, poverty, Security Council, United Nations. Bookmark the permalink.